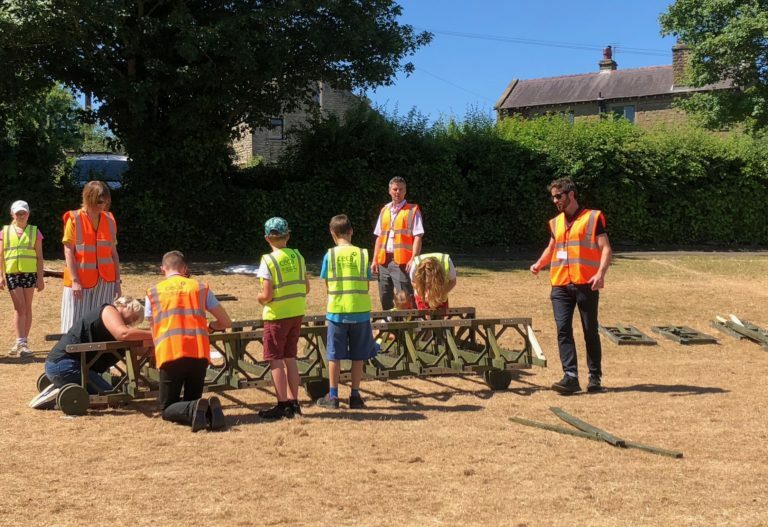 Civils Training Group, CECA and Cairn Cross Civil Engineering were delighted when we were asked to develop and deliver a full day of Civil Engineering activities for Year 5 and 6 pupils at Holmfirth Junior & Infant School. The children were provided with a brief at the start of the day, from which their activities began. The Brief: Their local town of Holmfirth had been badly affected by recent floods, which had resulted in a number of bridges being washed away, water utilities being disrupted, structures destroyed and had left many people homeless. 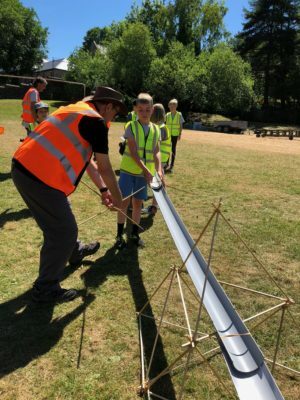 As a result, the students had to take part in the construction of two different bridges, an aqueduct, a tetrahedron structure and shelter building. 70 students took part in the outdoor activities, which lasted from 9.00am – 3.00pm, and the response was fantastic. The suspension bridge activity allowed two teams to work on the bridge over the space of an hour, working together to assemble the different segments and attach the suspension cables. Students demonstrated great communication and teamwork as they had to work together in a safe manner to get all the pieces together. They learnt about compression and tension, and were each able to take an active role in the activity. Ambassadors and teachers were impressed at the way the students followed the detailed instructions within the project. 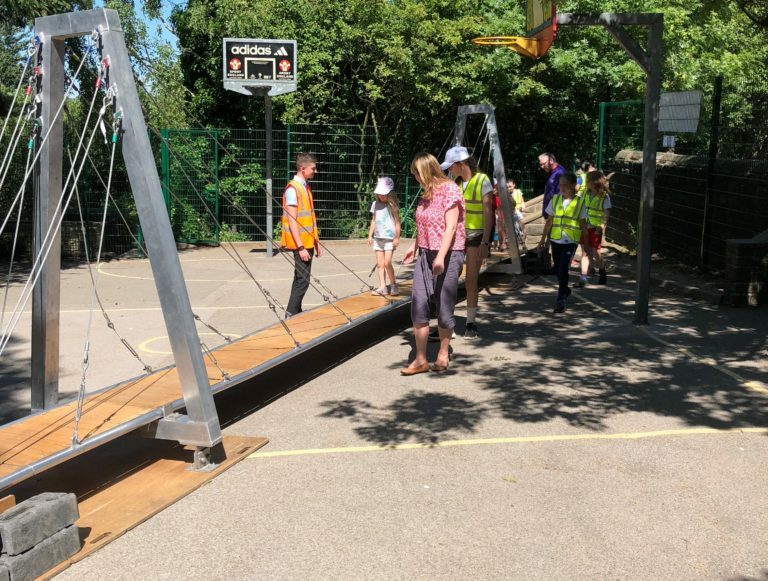 At the end of the day, pupils from nursery to Year 6 were given the opportunity to walk across the bridge and test the stability. Bailey Bridge is a type of portable, pre-fabricated, truss bridge. This replica, provided by the ICE, is constructed from wooden joints and boards, and has to be built using nuts and bolts. Each group had chance to construct part of the bridge during their session, with the completed bridge being tested at the end of the day as the whole of the school had to walk across it. Students had to demonstrate great problem solving and a lot of practical, hands-on construction skills within this session, as well as working together to ensure all the parts were constructed properly and that no parts were misplaced. Ambassadors were impressed at the number of students who were keen to get hands-on with this project, and were delighted to have a full bridge to showcase at the end of the day. Thanks to our Ambassadors on this project, Paul Curran (J N Bentley) and Oliver Chamberlain (SCP Design) for assisting students throughout the day. An Aqueduct is a watercourse constructed to convey water. In this case, it was a raised system of water pipes that was bring constructed for this purpose. In order to ensure that the town maintained a good water supply, pupils had to work together to construct a watercourse that was able to transport water from the top of the field to the bottom. Each group had a go at constructing their own small aqueduct, testing the systems with plastic balls before using water to fully gauge the success of the project. 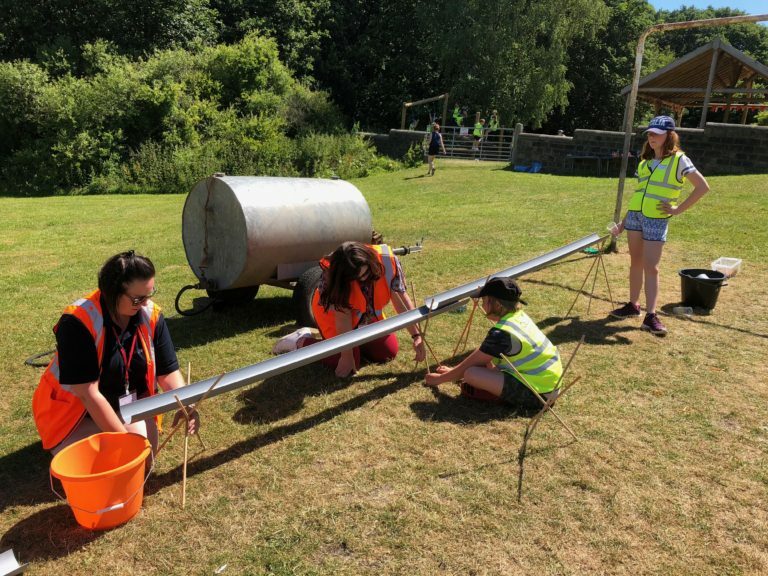 The final aqueduct was constructed by the end of the school day, and was tested using a water bowser to see if it could successfully transport water from one end of the field to the other without any leaks or structural collapse – and it was a success! Thanks to CECA’s Director of Civil Engineering, Peter Crosland, for leading the activity throughout the day. 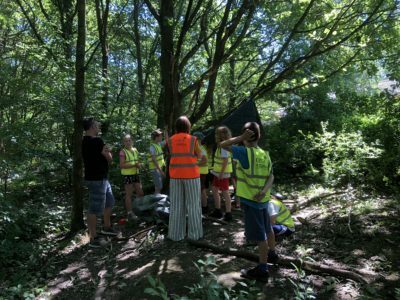 One of the other activities undertaken was shelter-building, which took place in the woods to the rear of the school. Students were asked to construct a shelter using a selection of natural (wood) and man-made resources (ground sheets, twine and tent pegs) that would hold 10 people and would protect them from the elements. The particular elements in question were a rainstorm (bucket of water) and a potential bear attack (teacher). The students really got engaged in this project, and worked well to come up with different ideas on structures and material uses for the structures, although there were definitely some slightly damp students after the testing took place, and the bear sightings did cause some alarm. 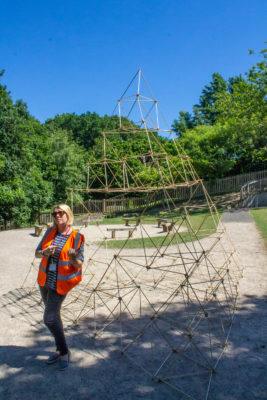 The tetrahedron is a small pyramid-like structure that can be used to construct larger shapes, and students were all able to get involved in building a Mega Tetrahedron throughout the course of the day. 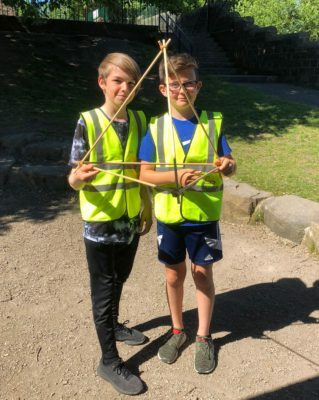 Using only canes and rubber bands, pupils were given instructions on how to construct their first small tetrahedron, and then develop these shapes into larger and larger structures. 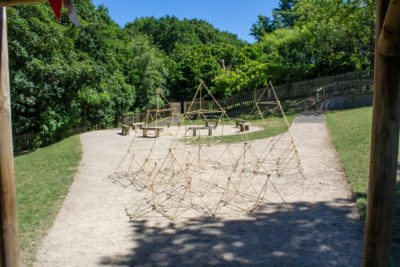 The final structure stood at over 3.5 metres high, and was constructed using over 1500 canes and hundreds of rubber bands. 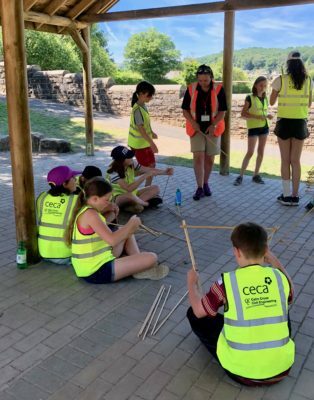 Jemma Carmody, CTG Training Officer and Training Manager for CECA, was really impressed by the way that the students quickly picked up the construction methods, and worked well in small and larger groups to build the tetrahedrons. At the end of the day, Headteacher Juilan Rose led an outdoor assembly for all year groups to show the great work that Years 5 and 6 had carried out through the day. From Reception to Year 6, all students were shown each of the completed structures and each was tested for strength / stability / functionality. Mark Roper (Executive Director, CECA) took the opportunity to thank the school for allowing us access to their school and for the help in organising the event. He also thanked the pupils for fully engaging in the activities and their excellent behaviour throughout the day. 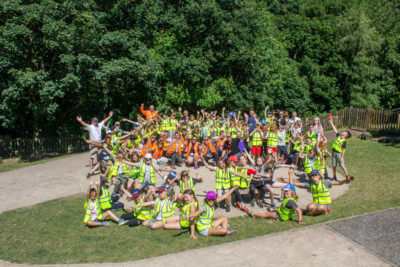 Huge thanks also go to Cairn Cross Civil Engineering and Director Phil Williamson, who arranged the event with Holmfirth Junior and Infant School, ensured that the equipment got to the site, and assisted throughout the day. Thank you to the school and everyone who helped make the day a huge success. If any CTG or CECA Y&H members are interested in running a similar event, or would like assistance in any schools engagement projects, please get in touch with jemma@ceca-yorks.co.uk.